Get braces! I just got out of one thing and I get into other... Had I known braces would be so effective to stop eating I would have get them before :P All my mouth hurts and since I have to wash my teeth after eating and after brushing 10 times in a day I found it to be very frustrating so now I'm just not eating between meals and chewing reaaaaaally slowly.. and I've drop another 2 pounds already :) But I didn't get the braces to lose weight... I had to get them and I've been postponing it for years... but they're so necessary now that I had to say yes. My advice? don't get the balloon... get braces! Are you serious? You put braces on to lose weight? Ayeeee! I need to lose weight too, but Ayeeeee. 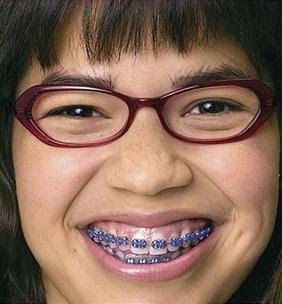 I love Ugly Betty, she is my favorite and only show to watch. She's coming back next Thursday. Viva Betty! Good luck. You must really be doing a makeover if you are losing weight and then doing braces. I feel so bad for you! I had braces when I was ateen and I still remember the pain associated with them. They do take an adjustment period. Best of luck that you get them off in a short amount of time. I wouldn't follow the doctors orders and I had mine on for five years! Iadore the quit humoured way you write.God idea to lose weight! i was one of the first kids to have braces in Junior high school! The *old fashioned* medieval kind~ every tooth had an individual metal BAND, not the glue on type. I had many adult teeth yanked, and was a full metal mouth for 2-3 yrs then had a retainer after that, with rubber bands! So i feel your pain :OP When it's all over think how easy flossing will be, lol! So so funny, hope your mouth feels better soon though. Not a bad idea. I just had all four wisdom teeth out and had the same results. Lots of soreness followed by having to wash out the holes twice a day makes eating seem like too much work! Did you get the purple ones? Danita you are so funny! I never had braces as a child but wish I had of done, my teeth are horrible and crooked! i feel so bad for you! we rely on the simplest things, day in day out, and then suddenly something goes wrong and *whammo*. bummer. i saw your work in somerset studio and immediately fell in love! somthing that really struck me was your depression and sense of lonliness. i feel exectly the same. i live in alaska in a town that is cut off from everything. my two best friends moved away. i suffer from major depressive disorder to the point that i can't keep a regular job... anyway. i refuse to wallow! just thought you might like to hear you're not alone out there. keep up the good fight! OUCH!!!! !How long will thye be on?? Sounds painful and time consumung! All that cleaning, etc, etc!! I am a candidate for braces, my bite causes jaw problems and headaches. But I have not gone there yet, Soon to be fifty and thinking I may have to do it , but I can't afford to lose weight. Good Luck with them! Did you get the fun colored ones? Lol! I got braces in my late twenties and it did wonders for my smile..the problem with having straight teeth all nicely together is that I received my first cavities..I think I have tone or two new ones on top of that!And I brush and floss daily! Too bad orthodontists can't throw in a free "wiring of ones jaw shut "while putting on the braces! OMG.....you're too funny. I had braces when I was 12....fun stuff. You HAVE to post a picture of yourself in your braces! maybe I need to get some, LOL! Nope, but my daughters need them. I think my oldest will be in them by the fall, since she finally lost all her baby teeth. I am glad you feel good with all the braces stuff...A dentist will put me braces on friday, I am nervous, any advice? You seem like a pretty amusing person, Danita! :) In this scenario, you’ll be able to hit two birds with one stone. You’ll have an even set of teeth and be able to lose weight at the same time! Loss of appetite is a common occurrence after getting braces. But count weeks and the hurting will fade. You still need to watch your diet though. You should avoid sticky food because they can get stuck around your braces.